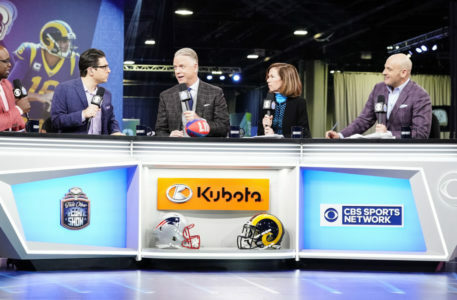 AV by: H&X Technologies, Inc.
Sets used for coverage of Super Bowl LIII on CBS. The coverage included two sets inside the Mercedes Benz Stadium with another outside. Game Day Plaza – located outside the stadium including desk and mini football field. Mezzanine Set – Main set with desk, standup positions and large-format video displays. Field Set – Small set used before and after the game for field interviews, etc. Filmwerks provided the stages with Mystic Scenic Studios providing fabrication. Some images courtesy of CBS / Mary Kouw.